CSN stores recently contacted me about doing another review for them. I chose this item to review because my 8 year old daughter was recently gifted with an American Girl doll for her birthday this year. I wanted to surprise her with some doll furniture, but didn't want to spend the American Girl Doll prices. CSN has many items available for the 18" doll sizes! The doll bed came in the mail a couple weeks ago. Hubby & I sat down to put it together. I was dreading the whole process---but it was a snap!! 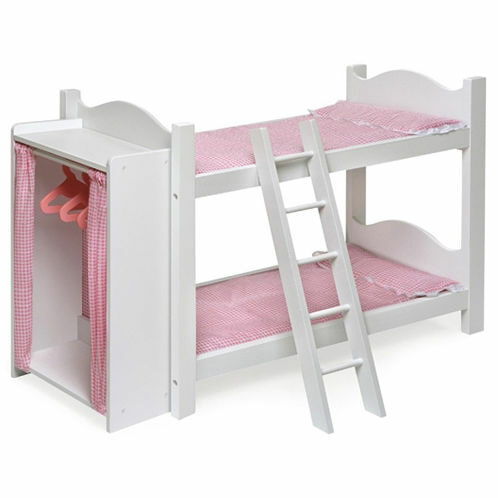 A couple of the pieces (the sides of the armoire) were mixed up as far as the letter codes in the instructions, but once we got past that, the doll bed went up in a jiffy. At the moment, the bunk bed/armoire combo is hidden in the basement, awaiting Christmas surprises. I am CERTAIN Zoey will love it! I am impressed with the quality of the bed. Nice size, sturdy. I plan on spiffing it up with some accent pillows...a little blanket...oh, you know how we crafty-types can get sometimes! How would you like a chance to win a $35.00 gift certificate to CSN stores?? Well, leave a comment then! The gift certificate will expire December 31, 2010, so let's do this quick! That is really adorable. I can just see making a few little quilts to go on those beds! It is nice to get AG *knockoff* accessories cheaper bc they are so expensive! Micheals is carrying "look alike dolls" now! I think thats great! I would love to snag some baby goods at CSN.com! Very cute little bed. I'm making doll clothes and accessories this Christmas too. This is such a cute little doll bed! I love it! CSN has SO much to choose from! How exciting, can't wait to (maybe) go shopping! the real question is... would i use the gift certificate to buy a present for myself or someone else? CSN what a great site. There is so much that they carry. Thanks for the heads up! We have an American Girl Doll and it's great to know there are other resources for cute furniture! I will for sure check out CSN! Oh I'd love to win CSN sells EVERYTHING! How awesome! So glad I found this as we're buying our daughter her first AG doll for Solstice. Love the bed. Oddly enough, I would not be giving that to my kids (they're both boys, so not cool) but my Mom would think she had died and gone to heaven. She has a couple American girl dolls that she loves to set up and display. Super cute! precious. I have two girls so I am sure I could use something like that. My little granddaughter would love this for her American Girls Doll. Now, her dad may not be thrilled that he would have to put it together, but I bet he wouldn't mind that much. Surely do hope I win. Learned about you from Laura Bray w/her column in the CharityWings newsletter. Csn stores are great. Thanks for hosting this giveaway. The bed came out great! I can picture the accessories you could make. And I would love to win a gift card to CSN :-) Thanks for the chance!! I have been wanting to win something from CSN! It would help out with Christmas gifts. I bought several things from Target for my daughter's American Girls dolls when she was young. It's so hard to justify those outrageous prices! I'd love a chance to get in on the giveaway. I would love to put it towards trunki. I think it is super cute luggage that my daughter could use during all the small trips we will be taking next year. I love the bed. My girls are very into AG stuff. My oldest mainly asked for AG stuff for Christmas. It's so nice that there are more options for cheaper stuff than what AG has to offer. I am making aprons for the girls and their dolls for Christmas. By-the-way, I loved your "thankful for" photo series! I'd love to get some new kitchen cannisters! Thanks for the giveaway!